Editor’s note: This story is reprinted from the February issue of GCU Magazine. To view the digital version, click here. It all started with a trip to the barbershop. Felipe Reyes plopped down in the barber chair and did what customers usually do when they go to the barber – start gabbing. About the kind of cut. A fade? Buzz cut? Crew cut? Then he wondered why it takes so long to find the right barber or stylist at a price that’s kind to your wallet. Wouldn’t the world be a better place if getting a haircut was easier? That small talk with the barber led to a more serious talk about creating a hair-grooming app where a user could choose from a list of barbers within a certain radius, see what it will cost, schedule an appointment with a licensed barber or hairstylist at their brick-and-mortar shop, rate the experience and even leave a tip, all on the app. Take that a cut further: Make the app the go-to place for scheduling a mobile hairstylist to come to your door. 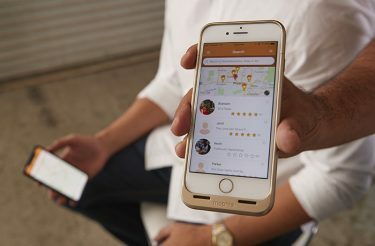 It was a lightbulb moment for Reyes, a Grand Canyon University alumnus who launched a beta version of the FADES app in the summer of 2018 with co-founders and fellow GCU alumni Dylan Santos and Kevin Llamas. 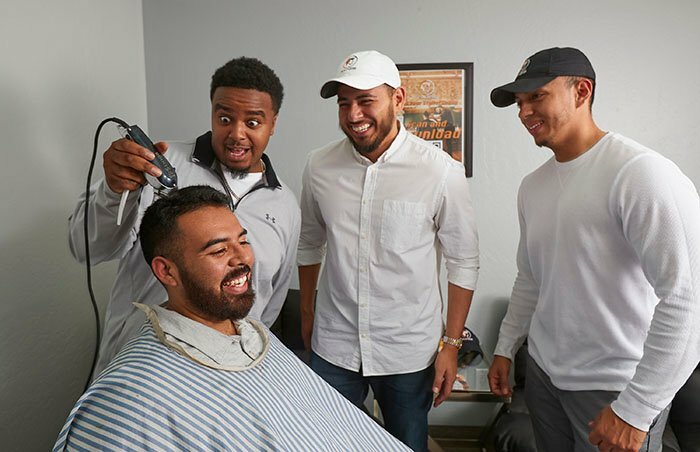 The irony: None of the FADES app founders cuts hair for a living, though Reyes cut his teammates’ hair when he played on the men’s soccer team from 2010-14. Another irony: None of them knew much about coding. Reyes, whose bachelor’s degree is in health care administration and master’s is in public administration, works at Banner Health as a practice supervisor. Santos, whose bachelor’s and master’s degrees are in business administration, is a contractor with Trident University and a manager at Smashburger. And Llamas parlayed his criminal justice degree into a paralegal job at a law firm. But entrepreneurially minded Reyes, who also founded the now defunct Holy Couture Clothing Company in 2013, saw a world of potential in the world of haircutting. Instead, they spent their hours developing their app. It wasn’t easy. Getting barbers and stylists to become part of their app community also was a challenge. They knocked on a lot of doors, grassroots style. The trio even carved out time, after attending the wedding in Europe of another GCU alumnus, to research the European styling business. “We had an opportunity to travel internationally to work with different barbers and see how the industry is run in Mexico, to see how the industry is run in Italy, how it’s run in Spain and Bosnia,” Reyes said. They quickly learned that price points vary widely, from a $40 standard for a haircut in L.A. to $35 in Texas, $25 in Phoenix and $5 in Spain. The app is nothing like it started out to be originally. Dealing with industry regulations has changed its focus. All three believe the future of the hair profession is in mobile businesses that go to people’s homes and make life more convenient for the customer. “If you have kids, that would be amazing, because who would want to wait with their kids at a hair salon or barbershop? It’s going to take some time (to educate people to use the app and to go mobile), but people weren’t doing taxes on their phone not too long ago, either,” Reyes said. The app, which is available for iOS in the App Store, is free for hair professionals to use, with a small processing fee added onto the customer side. “So it makes sense, at least for the organization’s sake of a barber fronting his business,” Reyes said. The team, which just completed its beta run of the app, is working with a team of developers in Ukraine and planned to relaunch FADES in the first quarter of 2019. Reyes said starting a tech business with his friends has been challenging, but it’s something he wouldn’t change. He has had the chance to live out his entrepreneurial dreams and, best of all, work with his GCU friends. Thank you for this. Making mobile haircuts easier to find will be really helpful for some friends of mine who have older loved ones who aren’t in shape to leave the house much, as well as for those with developmental disabilities that can sometimes have difficulty with waiting, distractions and unfamiliar location of salons and such. I will be sharing this article with a lot of people!